This historic, hand-hewn log cabin, built in the early 1900's welcomes you to Glacier Country. Located seven minutes from Glacier National Park's entrance, it sits on 20 private acres near the wild and scenic designated Flathead River. Walk the land, hike Glacier National Park, fish and float the wild and scenic rivers. 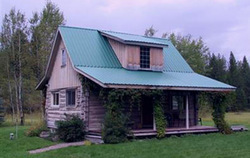 Relax in the solitude, quiet and privacy of your own newly restored and tastefully appointed historic cabin. Wildlife is abundant. Coyotes and deer frequent the meadow behind the cabin. The large front porch, small deck facing the meadow, and large fire pit add to your vacation memories. Here is a peaceful setting where time seems to slow down. Directions: Depart Glacier Park International Airport- turn left onto US Highway 2 East. Continue on US Highway 2 East for almost 18 miles through Coram, until you come to green mile marker 147, turn left onto paved Gladys Glen Road. Continue straight for 3/4 mile, until the road comes to an end. Turn right onto gravel lane to the cabin.